As a homeowner, maintaining your house’s features is likely a top priority. By doing so, you can keep your family safe and comfortable all year long. So, when it comes time to give your residential windows a much-needed upgrade, you should strive for the best. For your next residential window replacement, you might consider double-pane windows. The following are just some of the reasons why this durable window option will serve you and your family. According to the Efficient Windows Collaborative, the average home will save 15% of their energy bill every year when installing double-pane windows in a 2,600 house. While single-pane windows tend to be leaky, the duel panes will seal in air more tightly. Tired of your loud neighbors? Your home windows should act as a barrier between your home and noise. A second pane on your window can keep noise out of your home. And for privacy’s sake, these windows can also keep noise in. When it comes to protecting your home from intruders, you want the best windows possible. Double-pane windows are more difficult to break through, keeping intruders out. While these windows do not replace a quality security system, they are a great supplement. This benefit is especially significant if you live in a hurricane or tornado zone. Stronger windows can help keep flying debris out of your home and are less likely to shatter on impact. They can also be useful during snow storms and rain. Double-pane windows are highly durable, and are likely to last for years to come. Whether you are looking to get a high value for your purchase or to boost your home’s ROI, these features are certainly a wise investment. Just be sure to talk to your window company about maintenance best practices. When looking to improve your home’s windows with residential window replacement, it pays to look into your options. Here at Best Windows, we are happy to assess your window needs and recommend the best product for you. By paying attention to details and accounting for all factors, you can make your home a more comfortable and safe place to be. This sense of security is priceless. When your broken and leaky windows just aren’t keeping your home warm, it might feel like all hope is lost. Window installation is a warm weather job, right? Window companies can provide window installation services in the Winter; they will just need to take a different approach. Prompt window replacement will keep your home comfortable at last, protecting your family all season long. How do window companies install windows when it is cold outside? During the Spring and Summer, leaving a momentary opening in the side of your home might not be a big deal. In fact, it might actually be welcome. But in the Winter, professional window installers will take a different approach. The following are some of the best practices that companies will follow to keep your home as comfortable as possible during installation. One At A Time: One of the best ways to prevent excess air leaks is to only replace one window at a time. Your professional will likely focus on installing one window as quickly as possible before moving on to the next. Tarps And More Tarps: Your window professional will likely use plastic tarps and barriers to seal off any large openings in the side of your home. These will also be necessary to place on your floor, as workers can easily track mud and snow inside. Closed Openings : Since there is a large opening where your new window will be, installers will keep all other doors and windows shut. This is important even when they are moving in and out of your home. Low Temp Materials: Certain insulation foam and caulk are better suited for colder temperatures. Ask your window company if they have these materials and how you can best help them set in the cold. By scheduling window installation services in the Winter, you can enjoy more open booking since this time of year is likely not as busy for window companies. You can also enjoy the benefits of brand new windows right away, keeping your home warm throughout this chilly season. 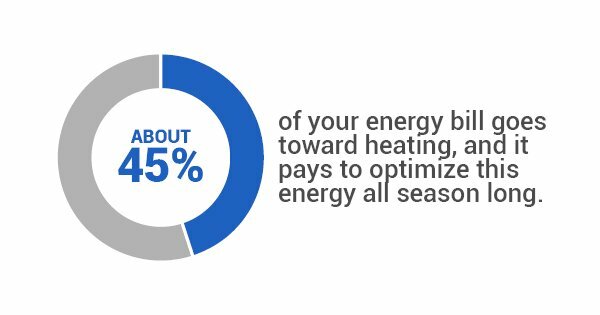 About 45% of your energy bill goes toward heating, and it pays to optimize this energy all season long. Your new windows can do this. For more information about Winter installation, contact Best Windows today. We are here to help make your window replacement as simple as possible.